It’s amazing how quickly we can fill up our closets and garage with all kinds of clutter. You might have even packed up some junk from your last place just to get it out. Instead of wasting space, why not turn all of that unwanted rubbish over to Junk King San Diego? Junk King San Diego is part of a national chain of professional junk haulers who have been in this line of work since 2005. In that time, they perfected a business model for junk removal. That begins with scheduling. Junk King understands how valuable your time is and doesn’t want to waste it. Their only going to ask you to set aside a two-hour window for your junk removal session. Most of the sessions are cleared out in under 20 minutes but that two hours allows the crews to get from one spot to the other. The majority of Junk King appointments are cleared within 24 hours but there’s also same day pickups available. Bottom line: Junk King San Diego likes to move fast! They are going to send over a two-man crew. This is the team that will be under your direct supervision for the duration of the assignment. It’s a crew that’s going to do all the lifting for you. It doesn’t matter if they have to bring something heavy down from upstairs or take apart something to fit it out the door. When Junk King says they do all the work, they literally do all the work. 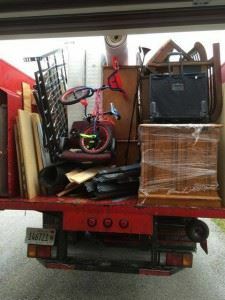 As for what happens to your junk after it’s been loaded on the truck you can depend on Junk King San Diego to dispose of it in a very responsible manner. That means donating to charity or dropping off to recycling centers. When you add it all up, it’s clear that the best way to get rid of your junk is to turn it over the Junk King San Diego today. This entry was posted in San Diego junk removal and tagged clutter, Junk, junk King, junk removal, rubbish on August 29, 2017 by Junk King. Last updated August 29, 2017 .